Climate change is emerging as one of the greatest long-term challenges facing society. 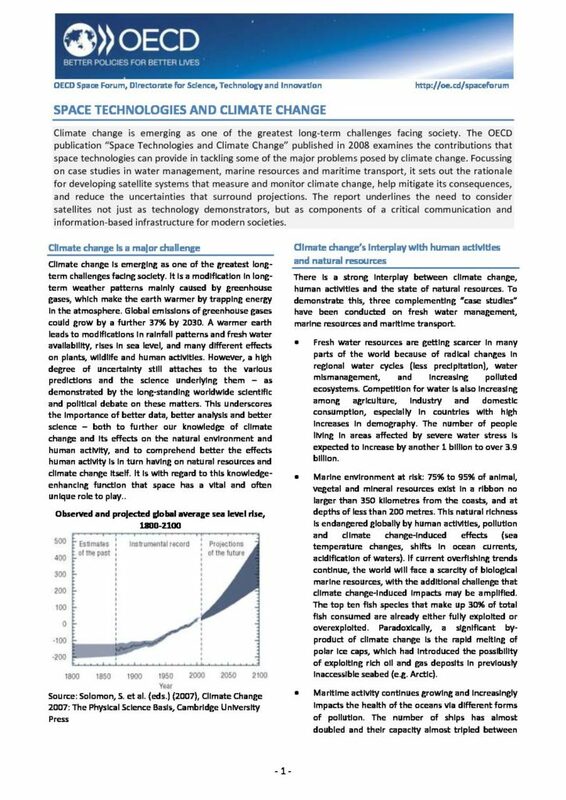 The OECD publication “Space Technologies and Climate Change” published in 2008 examines the contributions that space technologies can provide in tackling some of the major problems posed by climate change. Focussing on case studies in water management, marine resources and maritime transport, it sets out the rationale for developing satellite systems that measure and monitor climate change, help mitigate its consequences, and reduce the uncertainties that surround projections. The report underlines the need to consider satellites not just as technology demonstrators, but as components of a critical communication and information-based infrastructure for modern societies.